All items listed can be purchased from a Game Master. 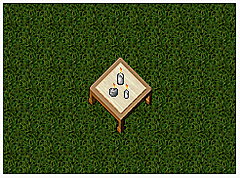 To obtain these items simply use the page system, in-game requesting assistance with purchasable deco. If you are in-game and want a close up view of the deco, you can also visit the Deco Store by entering the gate in the Oblivion Travel Hub. 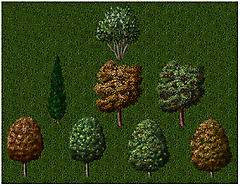 *Please note that trees do not bear fruit. Tree stumps are available for 25k with or with out axe in it. 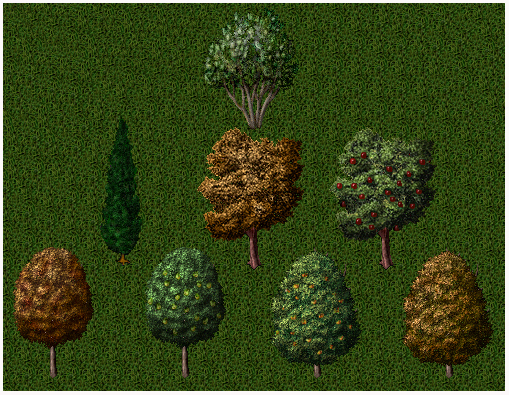 You may fence in forest area, but it will take away from your 3 tree limit. You must be able to travel freely around the house and yard. 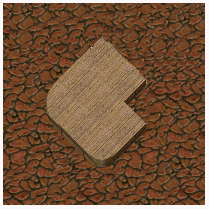 There must be at least 1 tile between an impassable object for example, 1 tile away from the side of a mountain. You can have two yards. 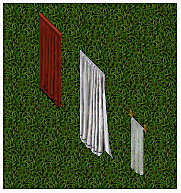 The first yard can not be longer then 8 tiles away from the house wall, meaning 9 pieces of fence. This first yard may be either a front(south) yard or side(east) yard. 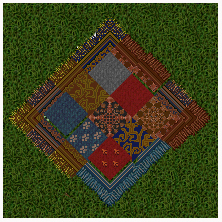 An additional second yard can be created but it can only extend 4 tiles away from the house wall, meaning 5 fence pieces. 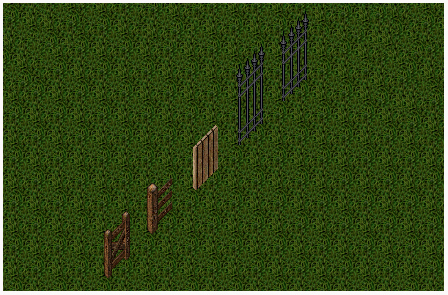 For added security, instead of having gates on your fence we will allow you to have locked down no more than two stair pieces on the side of your home. Doors that lead out of your home are part of the home system to allow you to secure them. Yards are NOT "secure". 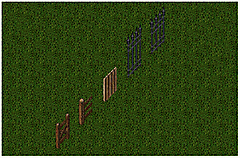 Fences can be shot through, cast through, teleported over, etc., so pets left in the yard are vulnerable. 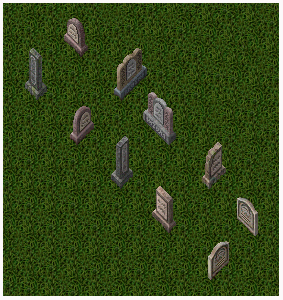 Yard deco will be strictly ornamental except for items like anvils, forges, etc. 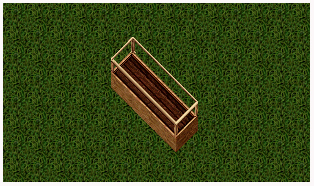 No locking down containers in yards for players to access since we cannot guarantee the security of the chest. If a GM finds a place where a house is backed up too close to another house's yard, it's going to be because the front house was placed after the yard was installed, and the owner of that house will be warned to move their house the required distance, or it will be removed for them. We are not going to force someone who has already paid for and had a legal yard installed remove part of it so a new house can be placed for someone else. A Game Master can help build and design carpets and ponds to your specifications. Water tiles must be locked down by a Game Master. 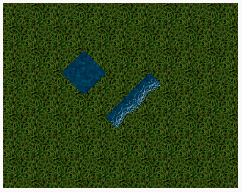 Water tiles are available for 5k per non-animated tile, or 15k per animated tile. Waterfalls are available for 15k per non-animated tile, or 45k per animated tile. Waves are available for 10k per tile. 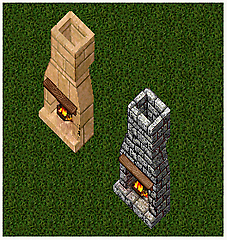 All fireplaces sold are available in South and East Facing in both brick and sandstone versions for 50k each. Fire places are tall and may appear through the upper floor of your home. You may be required to change your home slightly to accommodate the fireplaces or use deco to cover it up. 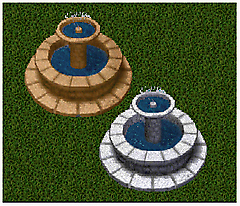 Fountains are available in both marble and sandstone for 50k each. Display cases are sold facing North to South and East to West for 10k per section. Pricing includes top and bottom pieces. Various books are available for 10k each. 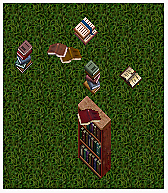 Bookcases are available for 10k for normal, 25k for broken. Guillotines can be bought facing west or south. Walls and doors are available for static homes for 10k per piece only in the style that is currently in the home. 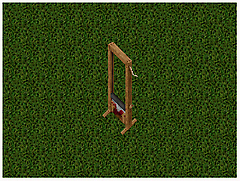 A teleporter may be purchased at the cost of 5k. These are only available for deeded or static homes. These are usually invisible to the player unless requested otherwise. 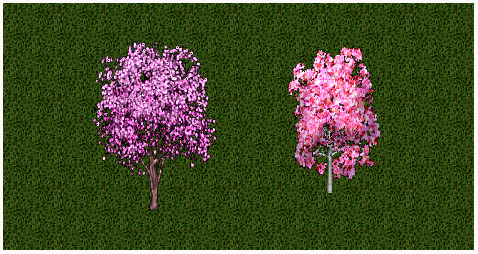 Deco items (ie: Items that are not usable or wearable by the player) can be dyed at a cost of 5k. You may only use standard dye tub colours. 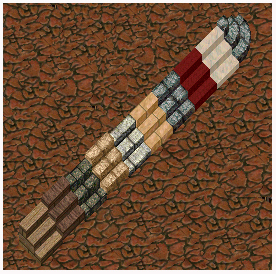 A Game Master can provide you with a dye tub to help you find the correct colour you require. Guildstones may be dyed at the cost of 10k. Some wearable items such as lanterns can be set to deco so they may be dyed. Items changed in this way will not be wearable or usable and will not be changed back. A Game Master can build a bridge between two yards if the two home owners wish it. 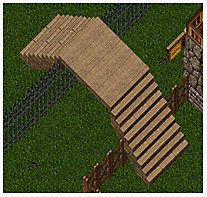 Bridges can only be placed if the two yards are no more then 1 tile apart, and must be built so that a player may walk under them to get by.A bridge can be no longer than four tiles long. Bridges will come at a cost of 5k per piece used.